Welcome back to part two of what I suppose is my end-of-year report on the roof garden. Year one was just a case of getting some colour going with Pelargoniums, Nasturtiums and Petunias plus a few gems but next year should be all about Lilies, Irises and Primulas, fulfilling the Himalayan/Caucasus remit rather better than the ton of South African bulbs and seed in Part 1. 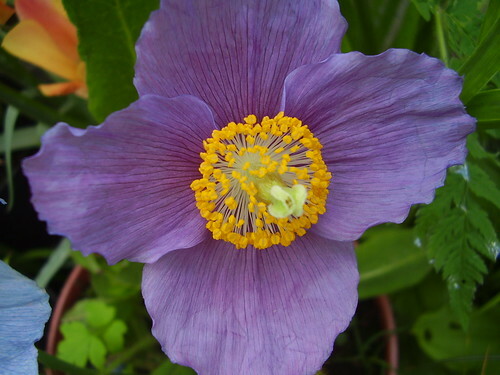 First of all Meconopsis: I have two pots of betonicifolia, seedlings (if the squirrel has left me any) of "Hensol Violet" and grandis a pot of integrifolia seeds with one seedling so far, and mature plants of superba and napaulensis. 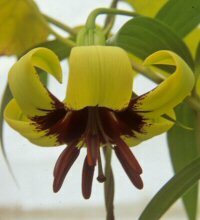 Now I'm going to bore you to death with Lilies and their close cousins, the Notholirion and Nomocharis. About half my lilies are seeds, some sown some unsown, the rest bulbs, almost all of flowering size. Let's get the Notholirions out of the way first: a very easy and rewarding genus that clump up well and aren't fussy about situation. 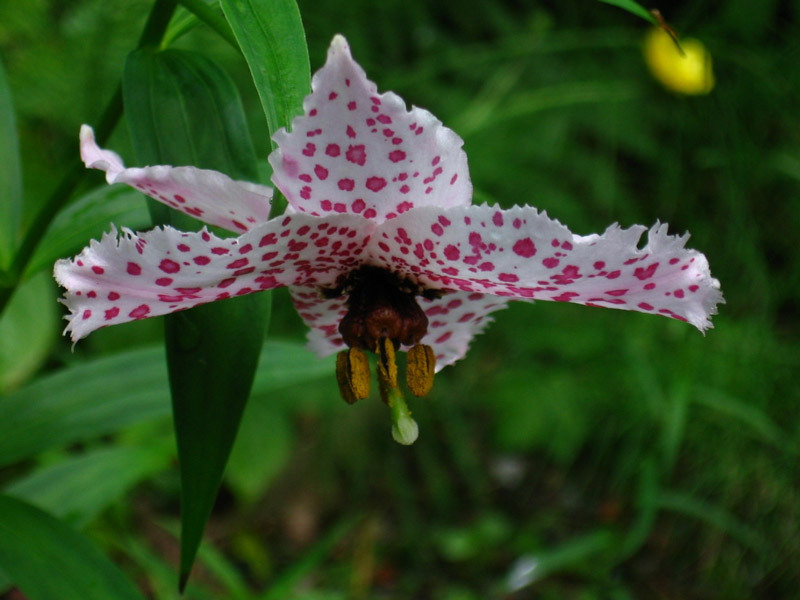 They are, in fact, beautiful pants, forming basal rosettes and sending up a 3f-4ft spike of lilac Lily-like flowers that are somewhat smaller than a Lily. That plant will then die (I can see a theme emerging) but it will leave behind plenty of bulblets which will flower in 1-3 years. The Nomocharis is a thing of enormous beauty and great variation and bloody hard to get hold of. I have N. aperta, N. Parthandina and N. mairei, the mose common ones. N. mairei. It's good to see it so happy in a pot as that's what mine will be growing in, the roof having no soil. Also good to see plenty of offsets. Previously called Lilium giganteum but now known as Cardiocrinum giganteum is possibly the stupidest thing I've ever bought. I have C. giganteum yunnanense, which is in a pot which should hopefully keep the size down because in the wild, or in the woods at Glendoick Gardens near Perth (Scotland, not Australia) where I got it and have seen it flowering in stunning drifts in the shade of beeches and surrounded by just-passed Rhododendrons it would grow to some 3m, flower and yep, you guessed it, die. 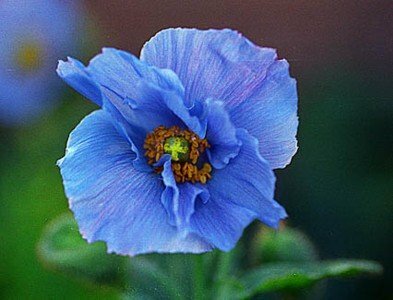 Fortunately it too will leave little presents which you can pot up or plant in a shaded nursery bed and they will flower quite quickly. The plant also makes HEAPS of seed. Each pod has at least 100 in it, sow in winter, with back and wait for seven years (really). Make sure the tips of the bulbs are above the soil or THEY WILL ROT. So, having put it off, here we go with the actual Lily Lilies. I'm not going to split them by geography, type, or any other criteria, I'm just going to go for it. Where I have seed but no plant yet, I will put a little (S) and where I have the real deal, I will put a happy smiley face. No I won't , I'll put a (B). I'm also not going to include hybrids other than first generation, even though the dirty great containers of five huge bulbs that should get to 2m (I have a plan for support) and provide much of the structure of the roof. And one's called Tiger Woods, which is quite funny. Presumably it will damage the metal container on it's way up and then cross-polinate with all the other Lilies, except the other four in its pot before disappearing for six months and then never really reaching the previous height. Ha, Ha. 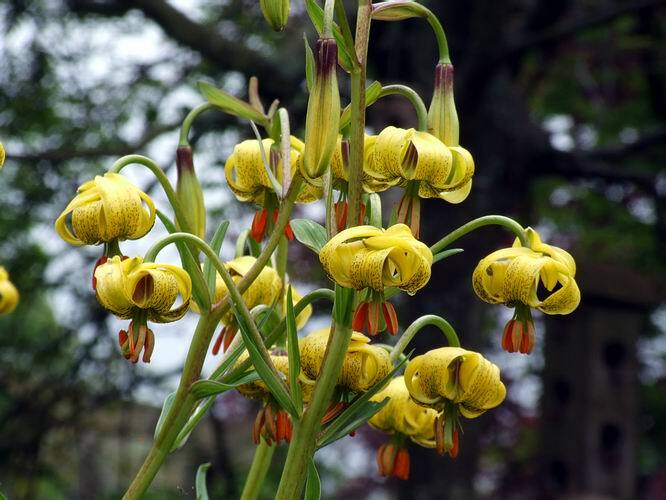 Lilium distichum: Reaches from a normal 50cm or so, up to 120cm tall when robust or shaded. Despite its height it is a slender and very graceful species. The stem sits with a decorative cartwheel whorl of leaves in the middle. Above this the flowers are borne in spikes of up to 12 and are a shade of orange-vermilion, the petals spotted with red-purple. Each bloom is out-facing and more or less flat-faced (with only the petal tips reflexed). The flowers are not symmetrical about themselves, something you will recognise when you see them. Readily grown and a humus rich soil in half shade. Still scarce plant in cultivation and poorly understood in botanical circles too. Lilium fargesii, just one of several species with an irresistable green/purple combo. It makes a small white bulb no more than 1.5cm across. A slender, short (15-20cm) stem bears scattered grass-like leaves. The flowers are Turk's cap, with broad petals. 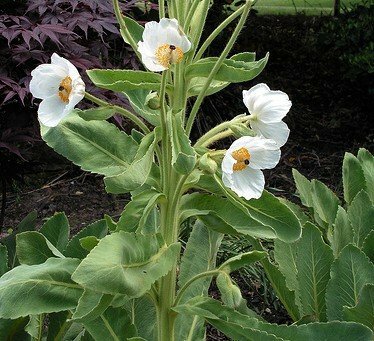 Plants are 1-6 flowered, each bloom 2-3cm across in a delicious shade of greenish-white. The petals are darker green in the centre and whitish at the edges and are spotted and dotted with chestnut brown. The whole flower is scented. As with many lilies this can be overpowering to some people. This is late flowering, at the earliest in late July in England and more usually in Aug-Sept.
First described by Franchet in 1892 but not seen in western cultivation until 100 years later, this is a native of grassy fields on the edges of woods at 1500-1800m N.W. Hubei. It reportedly grows at up to 2300m in Szechuan and Yunnan. It likes some shade and wind shelter coupled with good drainage, good air-circulation, cool to cold winters and humus in the soil. A dryish winter would elevate good cultivation to perfection. Easy to grow but very slow from seed.Short stems, just 15-20cm high, with disproportionately large, lemon-peel-yellow flowers each with long twisted segments, initially joined at the tips. Lilium Macklinae is a tiddler compared to many we've been looking at, reaching 1-2ft. It is found in the upper reaches of the Siroi hill ranges in the Ukhrul district of Manipur,India, at an elevation of 1730m–2590m.This shade lover has pale bluish-pink petals. In the wild it flowers in the monsoon months of June and July. Here it may bloom as early as May. 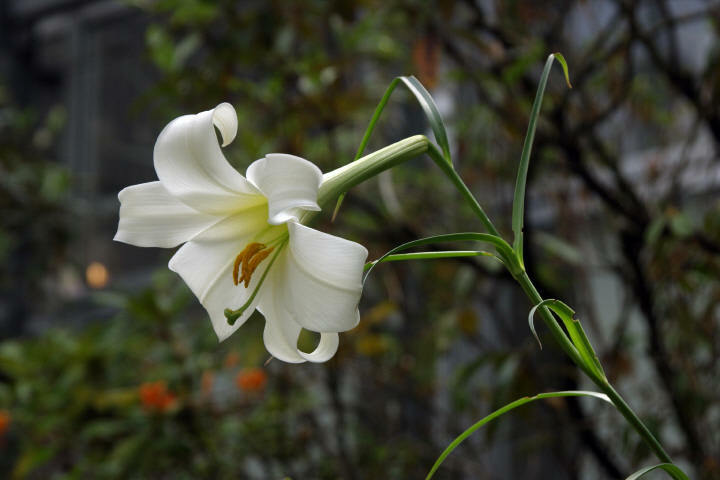 The lily gets its name from Macklin, the family name of Jean, the second wife of plant-hunter Frank Kingdon-Ward; it was discovered in 1946. The lily won the Merit prize of the 1948 Royal Horticultural Society at a Flower Show in London (but no longer holds an Award of Garden Merit). It is also the state flower of Manipur. 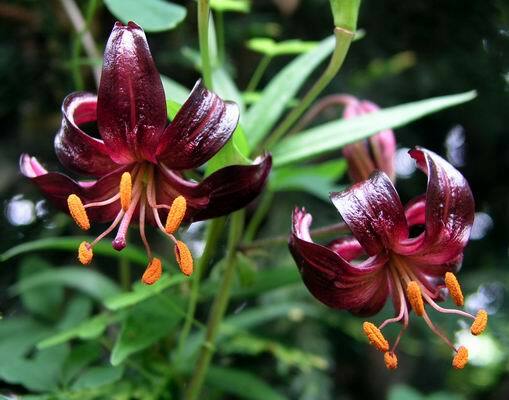 Lilium medeliodes: is a beautiful Japanese plant. Flowers are borne in a cluster of two to seven depending on vigour and vary from apricot to intense orange, with reflexed petals spotted and flecked in deep purple-black. 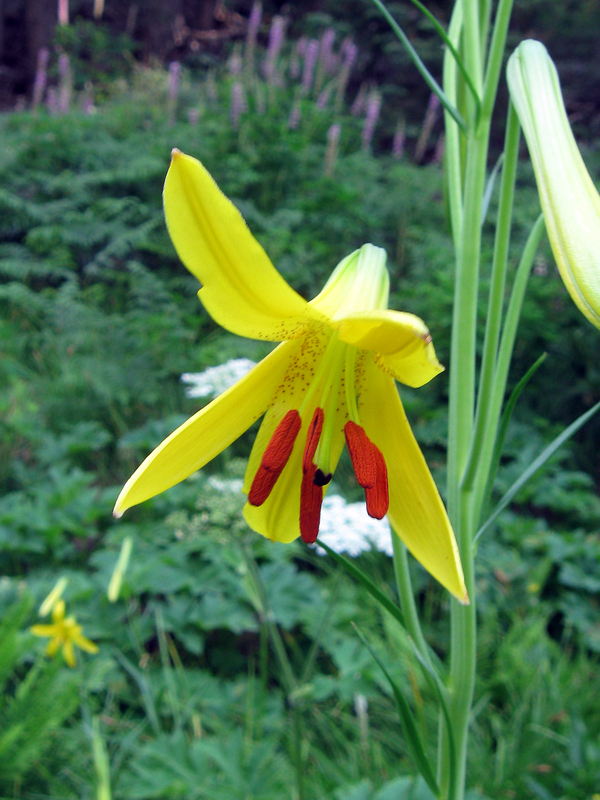 Lilium Michiganense. 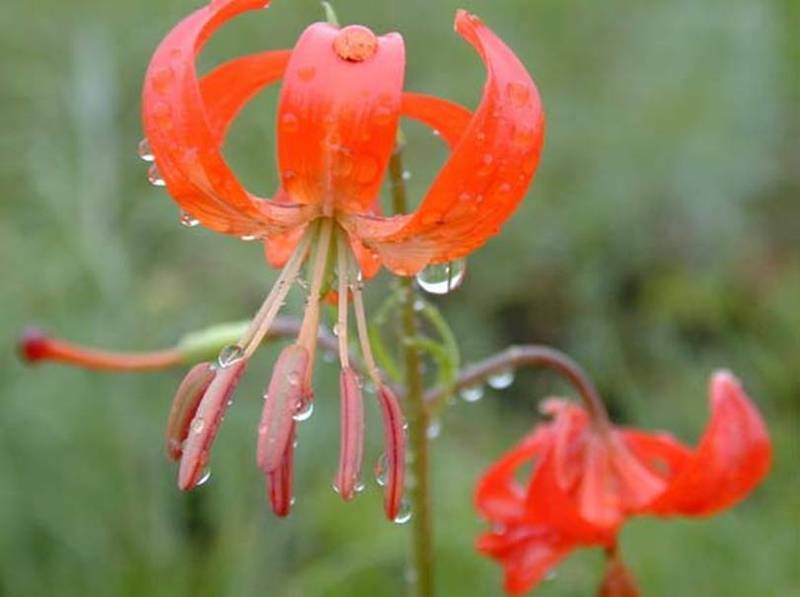 Coommonly referred to as the Michigan Lily, this is present in the wild in prairie habitats in the eastern US and Canada, as far southwest as Oklahoma. The flower is orange with spots (yes, another one). 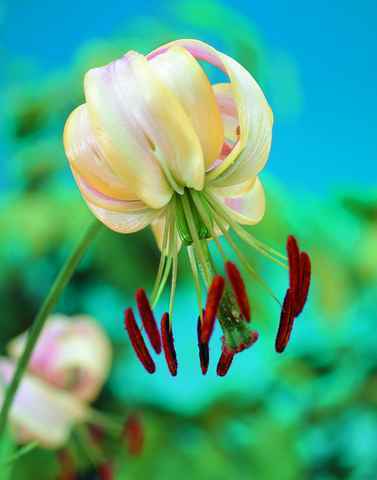 It is often confused with Lilium superbums and Lilium lancifolium. The leaf arrangement is typically whorled, but sometimes alternate just below the inflorescence and at the very base of stem. Narrow hairy leaves in dense spiralled whorls around the stem, stout spikes of scented, good sized, brilliant-yellow flowers with minute red speckles inside, all on stems less than a metre tall. An excellent, robust species. six years from from germination to flowering! (S). Iris pensylvanicum (syn dauricum) is also sometimes called the Siberian lily, being native to Siberia, Kamchatka, Sachalin and the Kuriles, northeast China, Korea, and Hokkaidō. The Latin name is misleading due to an error by the botanist John Ker. Lilium pumilum is a bulbous plant native to Mongolia, eastern Siberia, Korea and northern China. 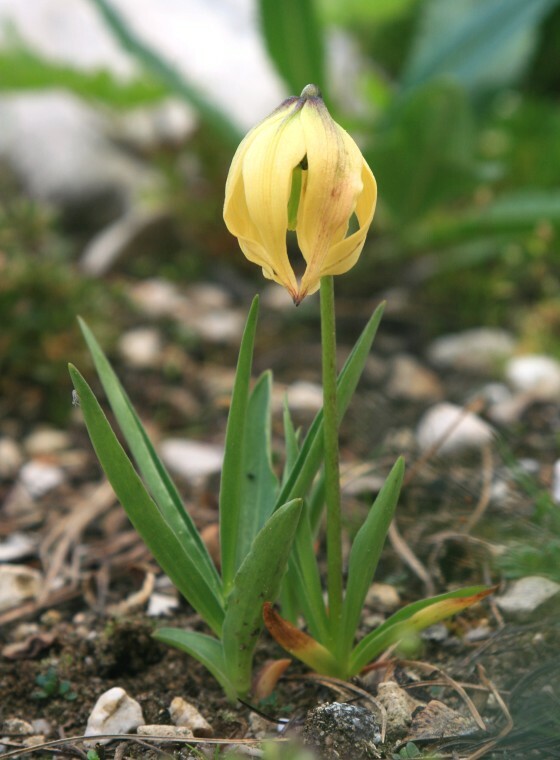 It is a stem-rooting bulb that grows up to 1 metre high, though usually a bit less. The leaves are slender and grassy. 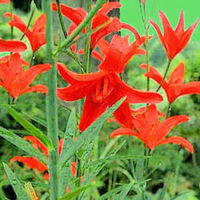 It bears from one to 2 reflexed and nodding flowers, usually A beautiful waxy red, which may be spotted with black. The flowers are scented. 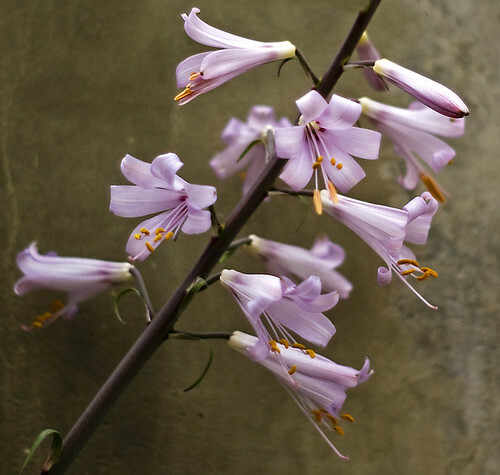 It was once known as Lilium tenuifolium and may be short lived in cultivation, but tends to last longest in well-drained soils. And possibly an orange as well. Great. But that might just be the red one. Lilium superbum. Oh hurrah, another orange Turk's cap! This fella grows from feet 3-7 high (not committing ourselved are we? 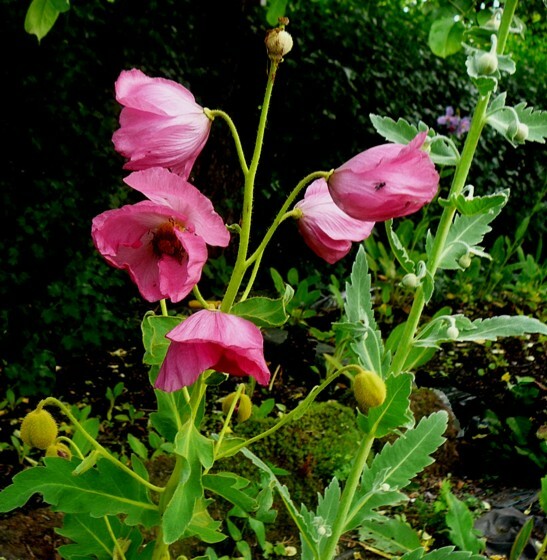 ), typically has 3-7 blooms, but exceptional specimens have been observed with up to 40 flowers on each stem. It is capable of growing in wet conditions. It is fairly variable in size, form, and colour: a range from a deep yellow to orange to a reddish-orange "flame" coloring, with reddish petal tips. 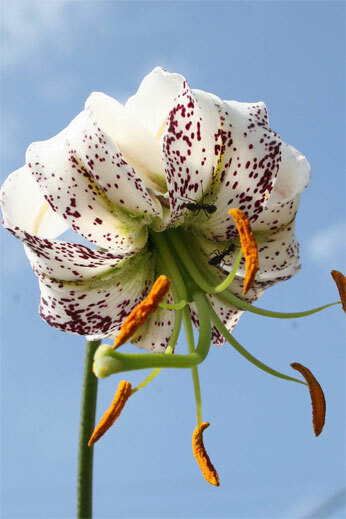 The flowers have a green star at their centre than can be used to distinguish it from the Asiatic "Tigerlilies" that frequently escape from cultivation. The species ranges from New Hampshire south to Florida, and west to Missouri and Arkansas.The roots were a food source for Native Americans, and the flowers provide nectar for Hummingbirds and larger insects. Great post as always and I wasn't bored to death with the lilies. Have a wonderful New year! Beautiful pictures! 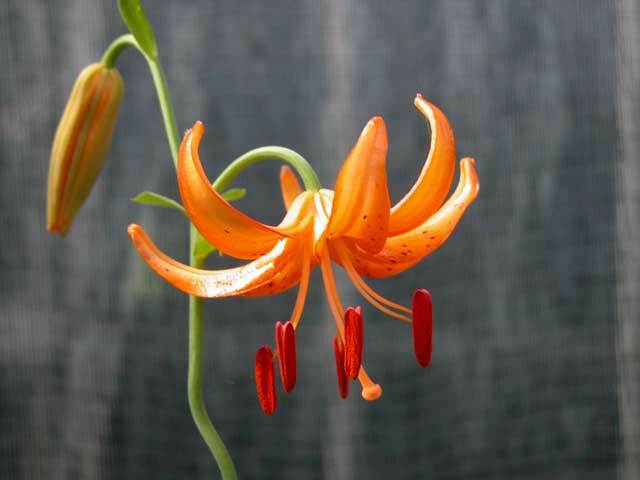 I was wondering if we could use your fabulous Double Tiger Lily 'Flore Pleno' on our website http://www.anniesannuals.com We would credit and link back to your blog.